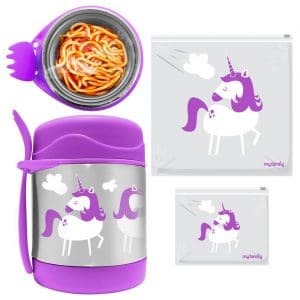 This blog post – Hot School Lunch Ideas – is sponsored by My Family Kids Brand and Lifestyle Parenting promoting the new My Family Insulated Vacuum Sealed Food Jar and Reusable Sidelock Bags. This blog post includes an affiliate discount code GOODIE so if you choose to purchase products from My Family Kids Brand I will earn a small amount of commission at no extra cost to you. There is a chill in the air, the days are shorter and there is no mistaking winter is officially here. Did you find this year that the coldness hit with a vengeance? I know I did. It’s all slippers and hot water bottles in our house. And our house is freezing. Brrrrr. Queensland homes are just not built for winter. And I know we shouldn’t complain as comparably our winters are mild. But still, it’s cold for us. But there is one silver lining – ALL the comfort food. I have been loving making soups and risottos for dinners and even better – taking the leftovers to work for a warming hot lunch. And it’s not just me getting in in the hot lunch action. Mr 6 is getting his fair share of the leftovers, which he adores. And I love that he is getting some warming, nutritious food as I know he is feeling the cold too. Of course he is – he refuses to wear his jacket despite the definite need to. Do your kids do that too? Why? He is a kid that dresses in jeans and a long sleeved tee on 32 degree days but when it’s 9 degrees he thinks he’s hot! Anyway. Enough of my mum rant. What could be better than a delicious, nourishing hot school lunch to help keep him warm and focused for a big day of school work and play. So this blog post is dedicated to Hot School Lunch Ideas that you can fill in an insulated food jar. I love packing a hot lunch for Mr 6 to take to school for lunch. And I love the new insulated food jar by My Family Kids Brand which stays hot for 10 hours and cool for 7. These Food Jars are designed using kid safe materials and they are a great size for school lunches. I love the funky, cute designs. These insulated food jars are complemented by a matching range of school lunch products that would make any kid the happiest in the playground. I especially love the cutest matching reusable Sidelock Bags that are great for packing snacks and sandwiches for a complete school lunch. If you would like to purchase any of the products from My Family Kids Brand use my affiliate discount code GOODIE for 10% off your purchase. One thing you do need to be sure to do if you are packing hot lunches for school is to make sure that you follow the pre-heating instructions correctly to ensure that the hot lunch stays hot! To use the My Family Food Jar you fill the inner section with boiling water for around 10 minutes. Then when it has preheated, remove and wipe dry then add the heated the food you wish to pack. You really need it to be hotter than you would normally serve it. Food will stay safely warm if you do not pre-heat it but for a comforting super warm lunch pre-heating is recommended. Soups are a great warming hot school lunch idea. They are filling and are so easy to make ahead. I freeze my soups in measured portions and defrost and reheat in the morning. My kids all love soups but their favourite has to be my Pumpkin Soup. 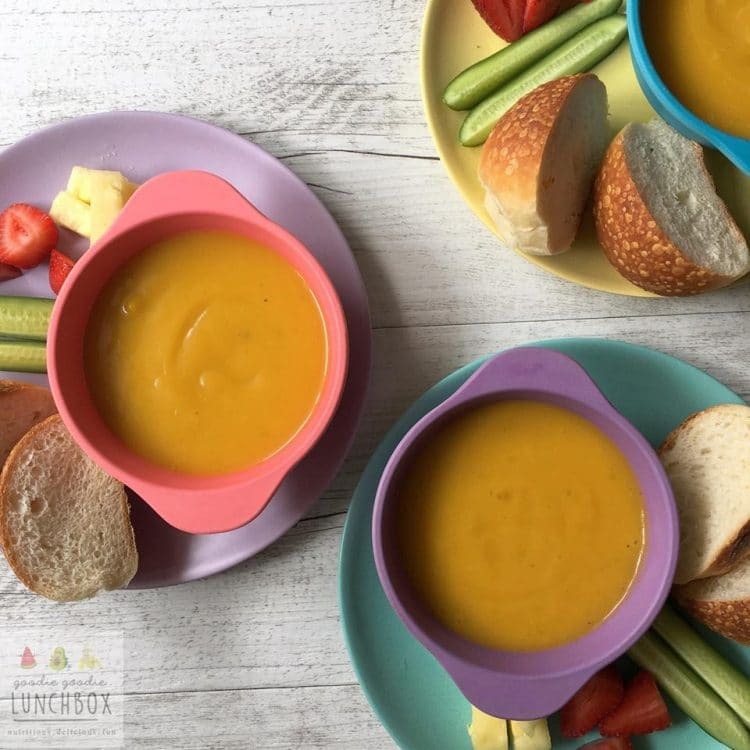 I have received so much positive feedback from other people on this soup too so if you are hesitant about trying soups for your kids I really would recommend trying this one. 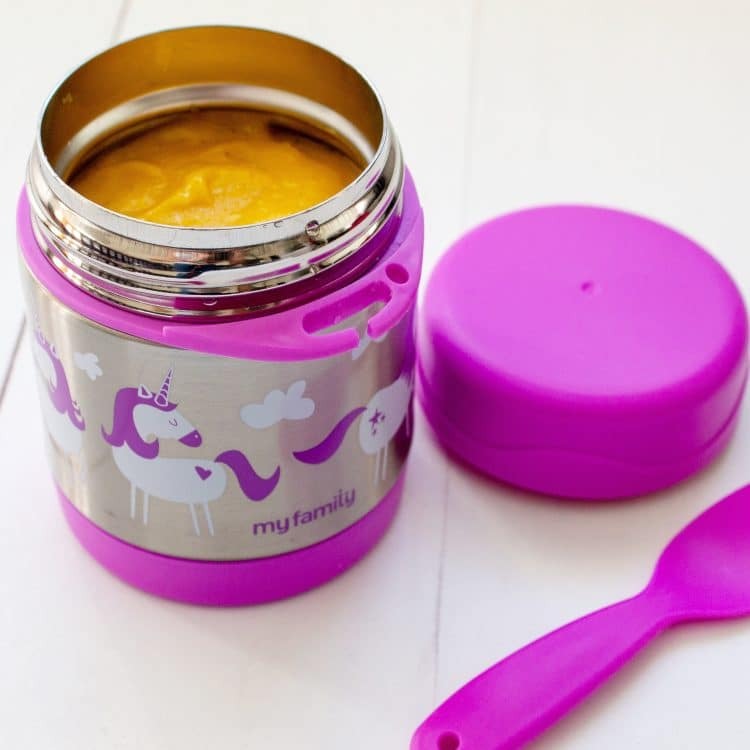 It is creamy and sooo nourishing. Dippers are your friend, serve the soup with english muffins, buns or bread rolls or even veggie dippers on the side in the My Family Reusable Sidelock Bags. Add toppings in the My Family Reusable Sidelock Bags for your child to add at school to add some interest or crunch – pasta, croutons, cheese, bacon (mmmm bacon) all make great toppings. I have got to say I am a pasta fiend. My kids are too #littlecarblovers. And pasta is a great idea for hot school lunches. This recipe for Sweet Potato Macaroni and Cheese from Kidgredients is a fantastic healthy twist on the kid favourite. I also adore this Stealth Spaghetti recipe by My Lovely Little Lunch Box. 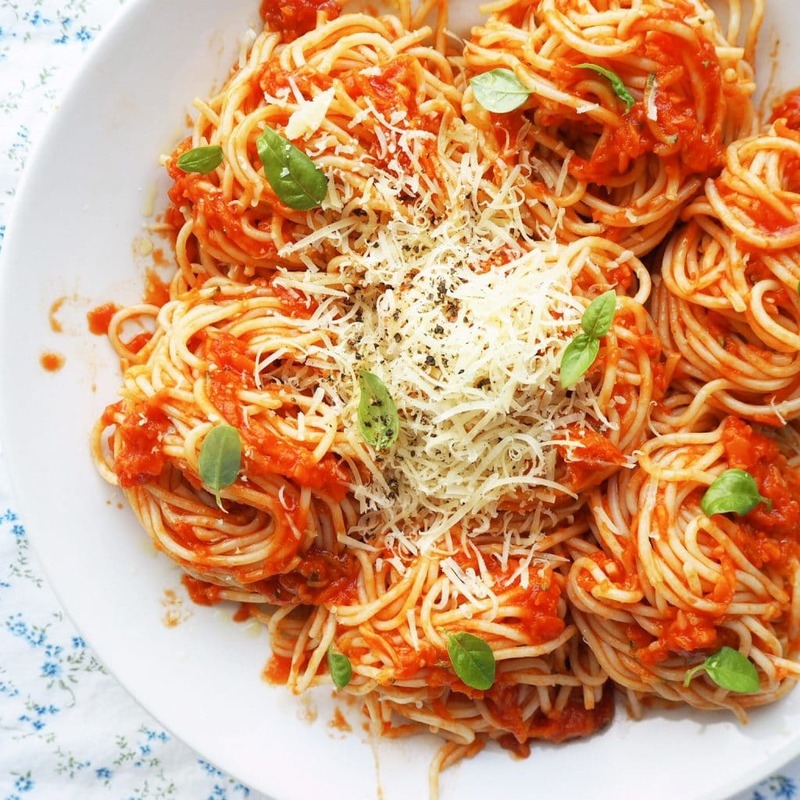 It is a favourite in our house, easy to make ahead and freeze the sauce in batches. I don’t think any round up post for Hot School Lunch Ideas would be complete without some rice recipes! This recipe by My Fussy Eater for Chinese Pork Fried Rice is a great gluten free hot school lunch idea. 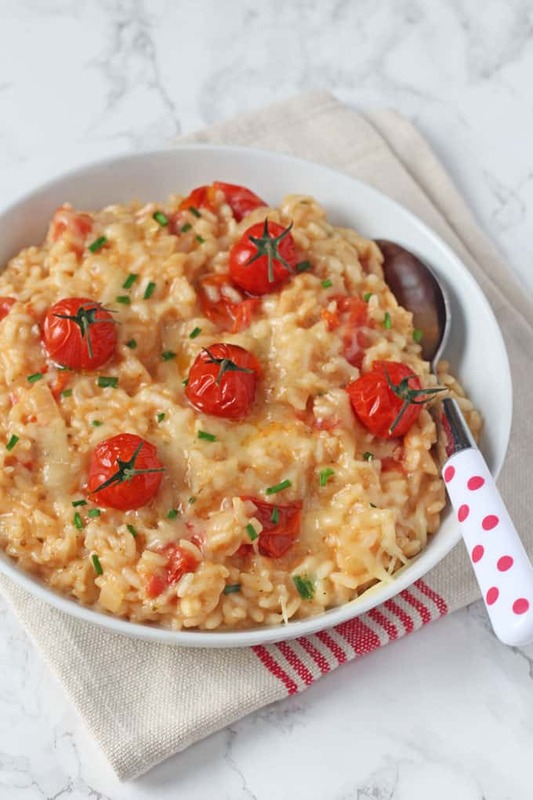 And I also love this delicious Baked Cheese & Tomato Risotto also by My Fussy Eater that would be perfect to take to school for a warming lunch. And if you are looking for a veggie lovers twist on rice try this delicious Cauliflower Rice for Kids by Dr Jennifer Cohen. Have these Hot School Lunch Ideas inspired you to get cooking and filling your insulated food jars for school lunches? 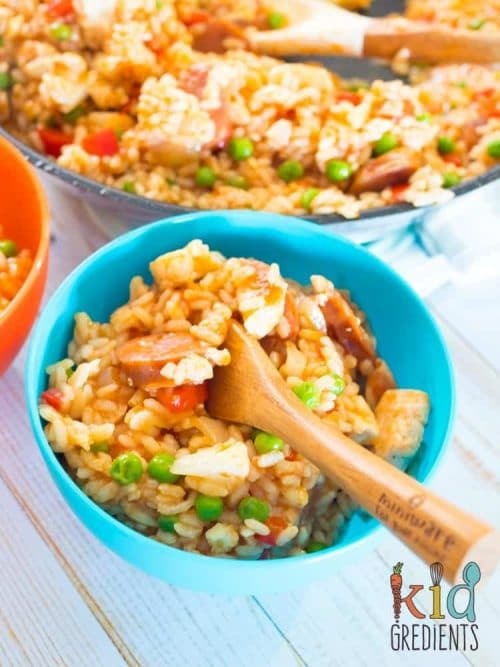 If you are looking for more ideas for your insulated food jars check out this recipe for Chicken and Chorizo Spanish Rice and more than 15 other ideas in this fantastic blog post by Kidgredients ’15+ hot lunches perfect for thermal containters’. I have been making Healthy Little Foodies delicious Vegetarian Chilli for Kids on high rotation as it jam packed with goodies and tastes great. It is a fantastic recipe and would be great as a hot lunch. You could serve this lunch with tortilla chips, corn and even avocado in the My Family Reusable Side Lock Bags. This is a totally nourishing and delicious hot school lunch perfect for insulated food jars. Image supplied with permission by Healthy Little Foodies. 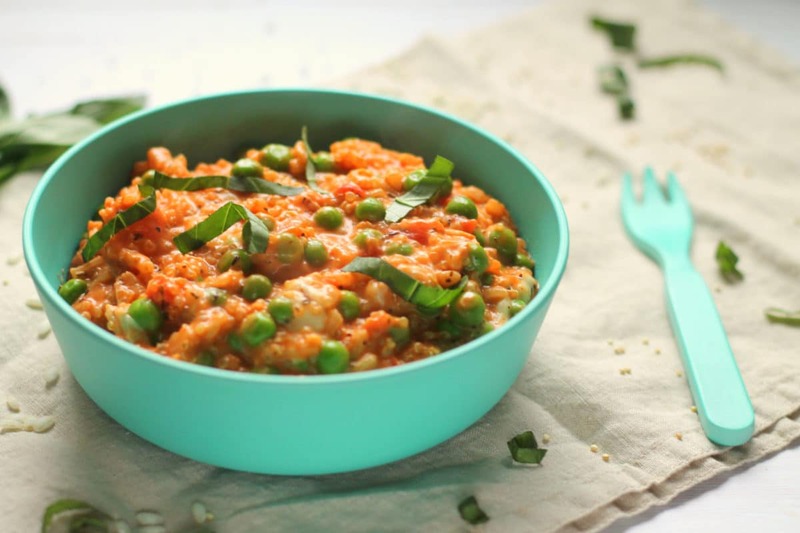 I also love the look of this Creamy Tomato and Mozzarella Quinoa Risotto by Happy Veggie Kitchen. I hope this blog post has inspired with all of these gorgeous Hot School Lunch Ideas. If you find yourself running out of ideas for school lunches, check out my School Lunch Guide for all my tips and tricks. 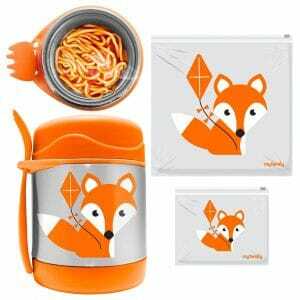 And remember you can use my affiliate code GOODIE to order the new My Family Insulated Food Jars and reusable Sidelock Bags and receive a 10% discount from My Family Kids Brand. Great tips thank you Nina!